I really didn't want to give this book a less than stellar review, but that is what is going to have to happen. I found the story to be very interesting and intriguing, but the pacing was just so slow! There is a lot that happens in this story, but at the same time it took so long for them to happen. I also really did not like that Mac (the MC) was aware of the audience. It disturbs me as a reader, because I just want to be anonymous, or pretending that I am the MC, but Mac was aware of me. She foreshadowed everything, and it was stuff that is to come in the other books in the series. The stuff that she hints will happen don't happen in this book and I found it to be just a ploy to make the reader want to read the rest of the books. I don't appreciate that, because I want the book alone to make me continue on, not what might or could happen later down the line. 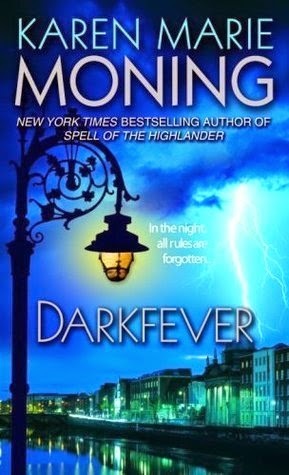 The one thing I did really like, and is the only reason I read it till the end, is Moning's writing style. She wrote things very well with beautiful descriptions to go along with it. I could easily picture everything and I really, really enjoyed that. Her writing is beautiful and for that reason, and that reason alone, I may eventually pick up book 2 in this series, but I did go ahead and put on hold the first book in her highlander series. In the end I enjoyed the story and am glad that I gave it a shot, but I just really wish I was an anonymous reader and that more things happened in a quicker pace. I think one thing that would have really had me in this series is if there was more of a romance. Sure there was some sexiness thrown in, but I wanted feelings and romantic gestures. I will say that so far I don't really care for Barrons, but I was pretty intrigued by V'lane even though I have a feeling V'lane probably won't be the guy Mac goes for later down the road. I'm not too sure I will be continuing on with this series. The storyline was way too slow for my liking, there wasn't enough romance, and I wish for the life of me that Mac wasn't aware of her audience. I hated the foreshadowing that she did for what was going to come in later books. What I did like, however, was Moning's writing style. It was beautiful and I loved how well she described things. I will definitely be checking out her highlander series in the near future. Because I have been hearing great things about this series and have been wanting to start it, but money is tight right now, so not able to afford it. Great review! I must admit that I was a bit hesitant about reading the first one. I didn't like the idea of aliens, but after I was in love with Daemon Black! Thats the same way I was. I was like there is no way aliens could be hot or interesting lol. But we were all sadly mistaken. Loved your review, it makes me even more excited to read it. I'm always a little wary about the last book in a series but it sounds like this one is awesome.